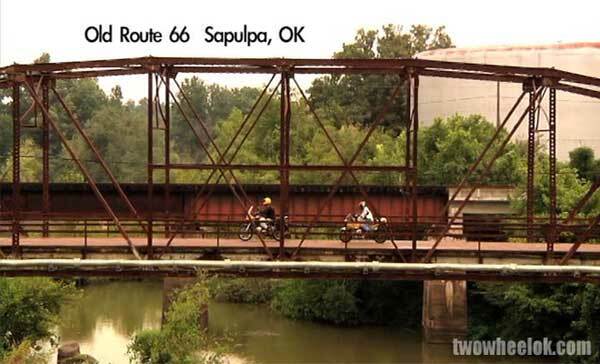 Brad and I made our television debut on a travel show called Two Wheel Oklahoma. The first episode that ever aired was about a stretch of Old Route 66 in Northeastern Oklahoma. We began that show on a crusty iron bridge over Rock Creek near Sapulpa, OK. That bridge, and the bumpy concrete leading west, is part of a very old roadway. A predecessor of Route 66 known as the Ozark Trail. So it seems only fitting then our first stop on the Forgotten Highways series be this little known network of trails and backroads known as the Ozark Trail. These scenes are taken from various episodes of a program we created in 2008 called Two Wheel Oklahoma.